Brexit champion Boris Johnson, the self-proclaimed ‘passionate Zionist’, with the elders of Zion. There is great rejoicing in much of the so called alternative media over the “Brexit” result in yesterday’s British referendum on membership of the European Union. If more proof were needed that the alternative media is often misinformed and credulous, this is it. Alternative types, from David Duke to David Icke, have of course been insisting for months that the Brexit movement represents a mighty blow against Zio-globalism. There may be some excuse for Duke to believe this guff: he is, after all, an American and presumably relies on British “white nationalists” for information about such matters. There is little or no excuse for British white nationalists themselves, or for British critics of Zionism like Icke, to be so deceived. The full meaning of Britain’s decision to leave the EU will only be appreciated in due time, but already it is causing some earth-shattering side effect. The financial markets and central banks are trying to reassure investors to keep calm and carry on, insisting that the historic drops in the British Pound are only part of temporary turbulence. After all the highly dramatic and strange events leading up to the Brexit referendum – including the shock murder of MP Jo Cox and the bizarre heavy rains and lightning storms on the eve of the vote – it is somewhat surprising that Britain indeed voted to leave the European Union, however narrowly at 52-48%. Figures great and small weighed in, and in many cases made dramatic pleas making the idea of leaving the EU seem like an earth-shattering prospect. The world’s most powerful bankers threatened financial chaos, too. The likes of Soros, Rothschild and several important figures at Bilderberg all warned that a Brexit would usher in great financial pain (one only wondered if it would be at their own hands). MUST READ — Is the ‘Migrant Crisis’ Part of a Zionist Plot Against White Europeans? The ‘migrant crisis’ that has blown up in our faces over the past few months has polarized opinions. Often we are presented with a false dialectical choice of ‘supporting the refugees’ wholeheartedly (by consenting to their continued trek deep into and across Europe as they please) or ‘supporting the wars’ that have caused many of them to flee their homelands. Why can’t one be opposed to both the wars and the proverbial tidal wave of migrants flooding into Europe, facilitated every step of the way by the Masonic European Union? The evil wars that have been unleashed upon the peoples of the Middle East over the past 15 years have undoubtedly caused havoc, devastation and tragedy for millions. First Iraq and Afghanistan were ransacked by America and its allies; then Libya was torn apart from within, backed up with NATO missiles raining down from the skies. And now Syria has been bludgeoned and dismembered through a covert strategy of tension which saw the US, Britain, France, Saudi Arabia and Israel clandestinely cultivate the cancerous growth of ISIS and its offshoots. The foreign policy pursuits of Western capitals are horrendous, destructive and harmful to all involved. And a large part of the problem is the death grip of Israel and dual-citizen Zionist Jews who occupy key positions in many Western governments, forcing their hand against Tel Aviv’s enemies. A list of militant, predominantly Jewish congresspersons opposed to the US nuclear deal with Iran was recently published in the New York Times, illustrating the reality that the West-Islamic confrontation which began in earnest a decade and a half ago is being led and stage-managed by extremist Jews whose first concern is Israel. I’ve spent the better part of the last two years almost exclusively dissecting the endless lies, deceptions and covert ops that have cascaded into what we’re seeing today in the form of unceasing internecine warfare across the Levant and the broader MENA region. It is an important subject, and the full truth of what Western powers have done to these people using bogus pretexts and ridiculous lies should continue to be emphasized. Destroying the Middle East, and reordering it in the interests of Israel and international finance, has been the fountainhead agenda of the predominately Zionist, Western power elite for the past 15 years since the CIA and Mossad conspired to bring about the ‘New Pearl Harbour’ event of 9/11. And the results of that heinous endeavour have been catastrophic. Some estimates hold that four million Middle Easterners have died as a result of US-led wars and interventions in the region since 1990. Countless millions more have been made into destitute refugees, and the wars have spawned millions of orphans too. The immeasurable atrocities that have been visited upon these people should be rectified by way of reparations and other compensation. And it is the war criminal politicians – George W. Bush, Tony Blair and the coterie of Zionist advisors behind them – who should pay to rebuild the countries that they have destroyed out of their own pockets, in addition to being charged and convicted of war crimes and dealt a just penalty. However, one “solution” to this problem that the elite are fully onside with is the resettlement of millions of refugees and other economic migrants from the Middle East and Africa into Europe. In a typical problem, reaction, solution scenario, the corporate and Zionist string pullers ruling the West have used the current synthetic crisis in the Middle East to forward their long-term plan to ethnically displace (and replace) the indigenous peoples of Europe in the furtherance of globalism. To back up this claim Griffin pointed directly to Richard Coudenhove-Kalergi’s plan to race-mix Europeans out of existence as part of his genocidal “Pan European” (i.e. anti-national) project kick-started in 1923 with the publication of his first book, Pan-Europa. Born in 1894, Coudenhove-Kalergi was the product of an Austrian-Hungarian diplomat father and Japanese mother. He is credited as a “Pioneer of European integration” and served as the founding president of the Pan-European Union movement for 49 years. Kalergi’s globalist, Illuminati-inspired movement was the precursor to the modern European Union (EU) established in 1993. In his many writings, Kalergi outlined his vision of a mongrelized Europe ruled by a Jewish aristocracy. This mass migration plan has been in the works for a long time, but they’re kicking it up several serious notches now, flooding the US borders while continuing to swarm European countries with any immigrants they can from a variety of cultures. What and who is behind it? Clearly staged US/NATO/Israeli sponsored terrorism and genocide are at work in the middle east, driving desperate people to seek asylum elsewhere, as the US mandates inviting in as many as possible over its southern border. And all in concert. As usual, they give themselves away in their own documents and bloated speeches to their own inner circle. 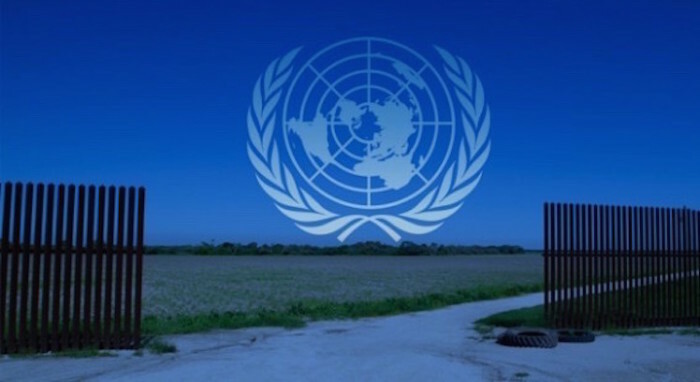 In particular, United Nations globalist fat cat Peter Sutherland, non-executive Chairman of Goldman Sachs and former BP CEO, never mind top Bilderberger and Trilateral Commission honcho, has come right out and stated their plan as plainly and arrogantly as possible. Chaos and economic disaster are still stirring up in Greece, with a sharp rejection of foreign control of their troubled affairs. More austerity and new rounds of loans? Voters in Greece’s emergency referendum were overwhelmingly against it. Whatever happens next, they stood up to the authoritarian tactics of the European Union. Hurrah. Greeks voted overwhelmingly to reject creditors’ proposal of more austerity measures in return for rescue loans, in the country’s first referendum in 41 years Sunday. Now signal the panic. Collapse may be impending. Then doom. Contagion could spread to America, too, and trigger global market implosion and derivatives meltdown. This weekend brought not only the “no” vote but the resignation of Greek finance minister Yanis Varoufakis, who angrily pointed the finger at predatory creditor banks who he said are using “terrorism” against the angry, defiant people of Greece. Yanis Varoufakis, Greece’s finance minister, on Saturday accused the country’s creditors of trying to “terrorise” Greeks into accepting austerity. 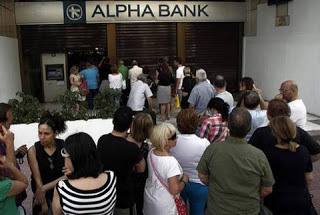 As things stand, the banks are still closed, ATM withdrawals are very limited and strict capital controls have imposed to avoid a full on bank run… but now they are looking to take deposit funds to cover the emergency as well. Anti-Russian protesters in Kharkiv, Ukraine’s second-largest city, pulled down a massive statue of Vladimir Lenin late Sunday, a sign of hardening anger toward the Kremlin in an eastern Ukrainian area where sympathies are split between Kiev and Moscow. The pro-European protests that swept Ukraine in the winter were accompanied by a wave of Lenin statues being pulled down, eliminating symbolic vestiges of the Soviet Union that had endured after its 1991 breakup. But few such statues were toppled in eastern Ukraine, which has long been a bastion of pro-Russian sentiment and where separatists have embarked on an insurgency that has cost thousands of lives. As usual with reports from the Western press, the deception can manifest itself just as much from what is omitted as from what is actually said. The Washington Post maintains that those who destroyed the statue were merely “anti-Russian protesters.” In reality, it was a mob led by literal Neo-Nazis of the notorious Azov Battalion – fielded and directed by Kiev’s Interior Ministry itself. While the Washington Post attempts to claim the statue’s destruction was a manifestation of the people’s will in eastern Ukraine, it was in reality a stunt pulled by some of Kiev’s most vicious, ultra-right, and illegitimate supporters – supporters the West works continuously to obfuscate from public view.